At the 2015 LA Auto Show, Lamborghini gave a stop to the rumors of new Rear wheel drive Huracan by unwrapping the Lamborghini Huracan LP580-2 2017. The new entry-level sports car fear RWD system and has sportive body with a design language that makes it more furious. 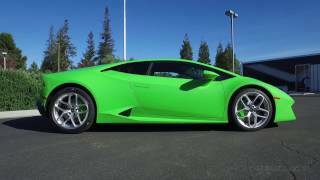 Let us have a look at the review of Lamborghini Huracan LP580-2 2017 to know in detail about the model. Though nothing much has been revealed regarding the interior details of Lamborghini Huracan LP580-2 2017, but expecting things considering the RWD stance, we can expect sport seats, and a driver centric cabin. Looking at the images we find black sports seats with contrast stitching in red. The same essence can also be noticed on door panels and the dashboard. The three spoke, flat bottom multi function steering wheel includes shift paddles behind it. While the instrument cluster gets a new look. There is a massive 12.3 inch TFT display included in the interior package as standard. The center console looks elegant with the knobs and buttons mounted with perfection. Apart to add to performance, you can notice carbon-fiber spreading its wings around while the upholstery is leather with surfaces coming drenched in Alcantara. Thus rounding up the interior details of Lamborghini Huracan LP580-2 2017 I would call it elegant and sportive. 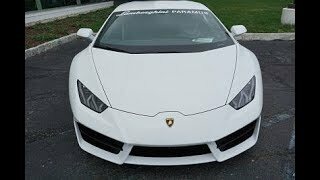 The exterior of Lamborghini Huracan LP580-2 2017 is very much similar to the all-wheel-drive sibling. Let us start with the front fascia, where we have the redesigned three-piece grille featuring a taller center section. Along the side of it we have horizontal canards delivering fresh air to the robust engine. The front design not only adds to looks but also increases downforce on the front axle and thus improving the performance. The rear portion of the model doesn’t bring enough changes yet has rogue appearance. The rear includes a three-piece grille under the taillights and the massive spoiler. While the diffuser gets a touch of newness. 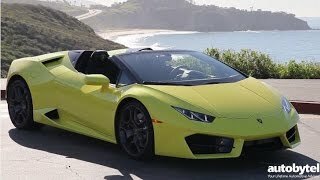 Thus rounding up the exterior details of Lamborghini Huracan LP580-2 2017 I would say rolling over the new 19-inch wheels the model looks extremely sportive and aggressive. 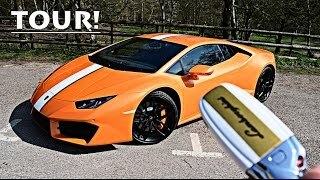 Beneath the hood of Lamborghini Huracan LP580-2 2017 is a 5.2 liter V10 engine cranking total output of 580 hp and peak torque of 540 nm paired to seven-speed dual clutch transmission. With this power rolling the new set of wheels, the top speed of Lamborghini Huracan LP580-2 2017 touches the mark of 199 mph while the 0-62 mph sprint can be knocked in just 3.4 seconds.